The fabulously handcrafted American Made Bow Arm Sofa is sure to be your favorite spot in the house. Our Amish made furniture is inspired by American values. DutchCrafters is a true American made furniture store only carrying furniture that is made right here in the USA. We know that our customers are interested in supporting the American economy which is why they care about also purchasing furniture that was made right here in the heartland. DutchCrafters Bow Arm Sofa has a Mission style that will complement any living room or family room. 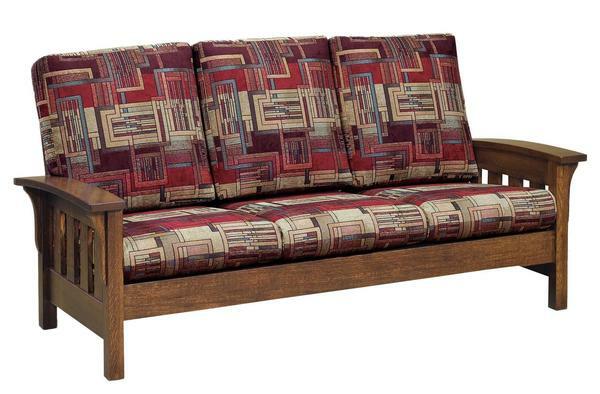 This sofa is handcrafted by Old Order Amish woodworks using Old Worlds craftsmanship techniques such as mortise and tenon. You know that this sofa is going to be heirloom quality that will stand the test of time. The webbridder coil spring bottom offers a very comfortable seat for hours and hours of enjoyment. Shop our wide variety of fabrics and leathers to complete the look. Call for assistance in finding pet and kid friendly fabrics. Choose from a wide variety of hardwoods for the sofa frame such as solid oak, American cherry, maple, hickory and more. Then select your finish color to complete the look. Call to receive wood finish samples to help you match to existing furniture in your home. Place your order online using our safe and secure checkout or call one of our Amish furniture specialists at 1-866-272-6773. We are happy to help in anyway that we can. We also have an Amish furniture outlet store in Sarasota, Florida.Call one of our friendly and helpful sales associates with questions on DutchCrafters and the furniture that we carry. You can also stop by our furniture store in Sarasota, Florida if you happen to be in the area. We look forward to meeting you soon.